A family favourite that always reminds me of childhood Sunday lunches is bread and butter pudding. 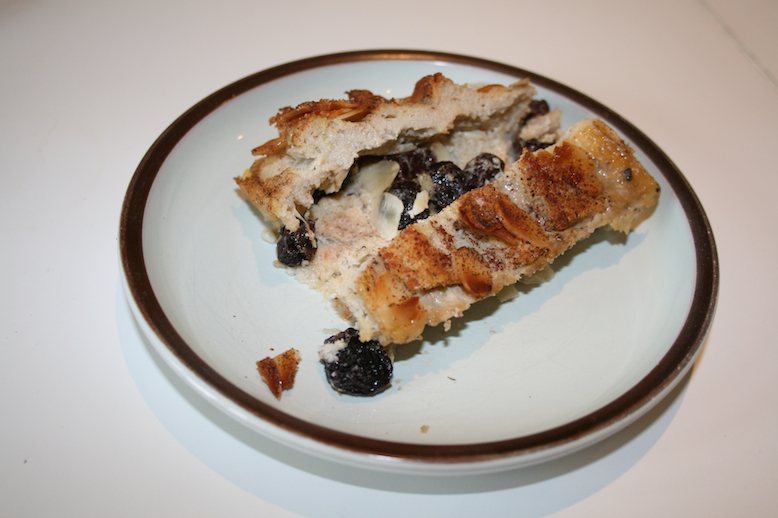 In my pre awkward eater life lots of butter, cream and Panettone contributed to a luxury version of my standard recipe, but these days I usually stick to sweetened soya milk and fruit breads. It is so simple to make, great for using up left over bread and very versatile - you can easily ring the changes by adding marmalade, chopped apricots, nuts, grated chocolate and by using different breads. Fruit teacakes can be used, but sliced tea loaves (especially this one with added orange) are ideal as long as you can tolerate wheat and gluten. If not, gluten free loaves can be substituted, but beware if you need to be egg free because this GF loaf does contain eggs. 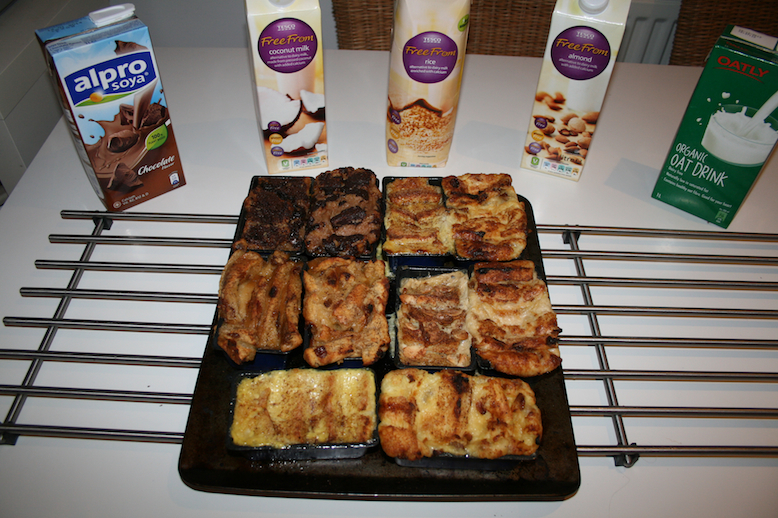 I’ve never made gluten free bread and butter pudding before and I’ve been meaning to experiment with different milks. A chance purchase of reduced gluten free bread and an orange fruit tea loaf (contains gluten) set me off on a test and taste trial... Normally I use a large ovenproof dish for puddings like this, but on this occasion I used little individual tins for comparison sake. The milks I chose are chocolate soya milk, coconut milk, rice milk, almond milk and oat milk. I wanted to try a vegan version too, but as the gluten free bread I was using contained egg I only made the fruit bread version vegan. I used custard powder and some sugar mixed with rice milk for the liquid. With each of the other milks I mixed enough to a beaten egg to fill a coffee mug and poured it over the slices of bread that had been spread with a sunflower margarine and cut to fit the containers. I added large plump raisins to the gluten free puddings with a sprinkle of sugar between layers and topped the chocolate soya milk puddings with grated dark chocolate. For the rest I used my usual grated nutmeg and a little sugar. 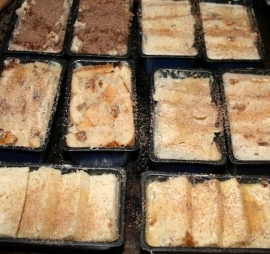 I left the assembled puds to stand (at least an hour for standard size pudding) before transferring to the oven. I then baked them at 180° for 30 minutes (or until nicely browned on the top, but with the custardy bread still soft and moist in the centre). The fruit bread versions all rose, but interestingly not the gluten free. When I took them out of the oven however, the tea bread puddings collapsed again. 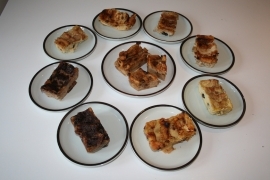 In all nearly everyone preferred the tea bread puddings, but the gluten free ones looked much better. I would add some interesting flavours to the gluten free next time as I think it is the flavoursome tea bread that made the difference – not whether the bread is or isn’t gluten free. 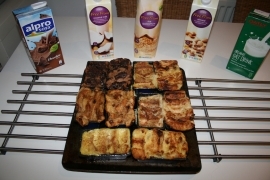 In all, my favourites were the coconut milk tea bread version and the chocolate soya milk gluten free pudding. I haven’t given an exact recipe, but if you’d like to make a version yourself, spread sliced bread (with whatever spread you can eat) cut into inch wide fingers (or squares or oblongs) and layer in a dish with dried fruits and a sprinkle of sugar. Pour over enough liquid (3 well beaten eggs topped up to three quarters of a pint or 400mls of milk) to almost cover. Finish with a layer of overlapping squares of bread for best results. Leave for an hour whilst the bread soaks up the custard mix and then finish with more sugar and a generous grating of nutmeg. Bake in a medium oven until the top is browned and crispy and the middle is just set.